Applications are open at 2501 Pitkin Ave., a newly constructed building developed by the Cypress Hills Local Development Corporation. 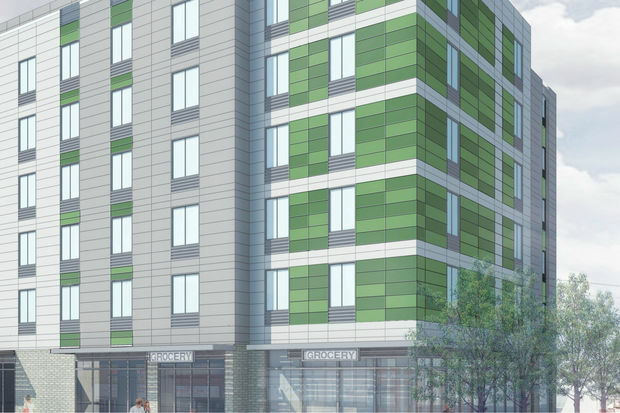 EAST NEW YORK — Applications are open for 47 below-market-rate apartments in a new residential building, where rents cost $558 for a one-bedroom and $676 for a two-bedroom. The lottery is for one, two, and three-bedroom apartments in a new building located at 2501 Pitkin Ave. at Berriman Street, with amenities including a community room, bike storage, a laundry room, a backyard patio, a playground and a garden area, according to the city’s Housing Connect Website. Applications are open through Nov. 27, and can be submitted online or by mail. The seven-story building will have 60 units in total and is being developed by the Cypress Hills Local Development Corporation. It's a block away from the Shepherd Avenue C station and is also accessible by the J, Z, 2, 3, 4, and 5 trains and by the B14 bus. The lottery is open to people making 40, 50, and 60 percent of the area median income, with unit rental prices depending on a tenant’s AMI, according to NYC Housing Connect. The 40-percent AMI units range in price from $558 for a one bedroom to $676 for a two bedroom, and are open to applicants with incomes between $21,086 and $38,160, depending on unit size and number of household members. Applicants at 50 percent AMI can snag a one, two, or three-bedroom apartment varying in price from $720, $870, and $1,000 per month, with applications open to those making between $26,640 and $55,350. ► INTERACTIVE: What Is AMI? The 60-percent AMI one, two, and three-bedroom apartments vary in price from $882, $1,065, and $1,224 per month, and are open to applicants making between $32,195 and $66,420, depending on unit and household size. The building’s affordable units were financed through the Extremely Low and Low-income Affordability program of the city’s Department of Housing Preservation and Development. For more information on income levels, available units, and how to apply, visit the NYC Housing Connect website.